Oshane Thomas's maiden five-fer, followed by Chris Gayle's record-breaking half-century in a brutal batting assault on England pacers, helped Windies draw the five-match ODI series 2-2 with a commanding seven-wicket win in the final fixture, at the Darren Sammy National Cricket Stadium in St. Lucia on Saturday (March 2). Windies, thus averted their 18th series loss on the trot in the format. 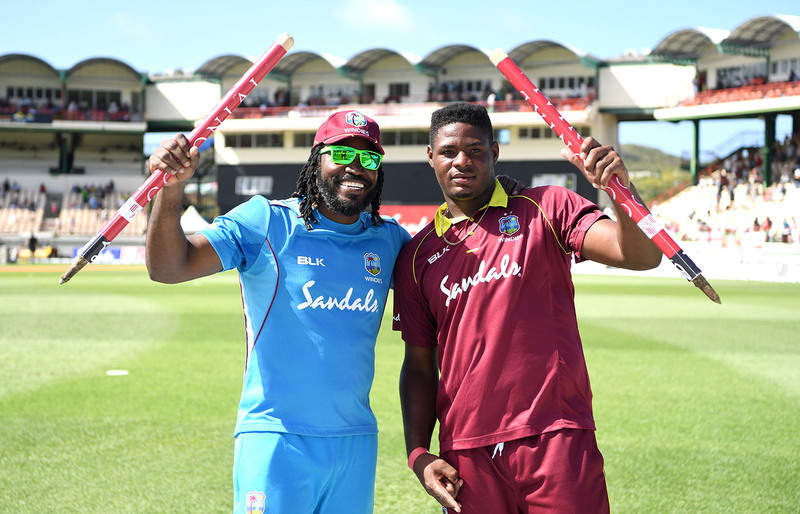 Windies meant business in the series decider, and showed exactly that with their clinical bowling show to skittle England for just 113, but the lowly target didn't stop Gayle from having his own fun. The left-handed opener slammed the fastest fifty for a West Indian, off just 19 deliveries, studded with half-a-dozen sixes, to better Sammy's record of 20 balls, and in the process, set up the hosts' easy win with more than 36 overs to spare and even before a formal "innings break". Set a target of 114, Gayle blew the English bowlers away with his whirlwind 27-ball 77 that included nine sixes and five more boundaries. He went after Chris Wokaes and later Mark Wood, but almost single-handedly dictated the chase for the eight overs that he lasted in the middle. Woakes was hit for back-to-back boundaries and then a six in his opening over itself, and there was no turning back from there. His next over yielded 23 runs, including three sixes. Wookes, and England, momentarily thought the carnage was over when he had the batsman caught in the deep off a short delivery but the umpire deemed it a no-ball for it was his third bouncer in the over. Gayle took the attack to Wood next, who was dispatched for five sixes and a boundary in the space of two overs. England did pick up some consolation wickets with Wood dismissing the two openers and Woakes disturbing Shai Hopes's stumps in the ninth over, after having leaked 50 in his five-over spell by then. But with Windies 95 for 3 at that point, it was hardly going to bother them. Darren Bravo and Shimron Hetmyer wrapped up the formalities off the first ball of the 13th over to give Windies a series-levelling win without breaking a sweat. Earlier in the day, Windies pacers rattled England with short balls after Jason Holder put the opposition in to bat in bowling-friendly conditions. Nearly all of England's batsmen got starts, but Windies' regular strikes prevented any partnerships from flourishing. The platform was laid by the early strikes of Sheldon Cottrell and Holder, before Carlos Brathwaite piled on more damage in his miserly eight-over spell, and Thomas eventually ran through the tail. England lost their last-five men for the addition of just two runs, and eventually folded for their lowest ever score against Windies barely days after posting their highest ever. Cottrell temped Jonny Bairtstow into a drive as he followed up his short delivery with a fuller length one. The English opener took the bait but the ball seamed in a tad and took the inside edge to knock down his leg-stump. England had barely recovered, and Joe Root barely settled in, before Holder got rid of the new batsman with a short ball. The extra bounce in the pitch did him in as Root attempted an uppercut only to see Cottrell pouch a dolly at third man. Brathwaite's spell next suffocated the life out of England's innings. The Windies T20I captain sent down his eight overs on the trot, giving away just 17 runs but crucially, breaking two partnerships that threatened to revive England. After the two early setbacks, a brief 39-run partnership ensued between Alex Hales and his skipper, Eoin Morgan. Hales picked up four boundaries in quick succession to push England past the 50-run mark, but Brathwaite had his revenge as he banged one short and induced an outside off his bat that was caught behind easily. Likewise, when Ben Stokes seemed to be slowly settling in - having picked up a couple of authoritative boundaries off Thomas to get England a move on - Brathwaite cramped him for room with a short ball that rose sharply and brushed his gloves on the way to the keeper. England were staring down the barrel at 88 for 5, and in the meanwhile, Thomas had bounced out the centurion from the previous game, Morgan, on 18 for his first wicket of the day. Holder, though, decided against bowling-out Brathwaite and brought Thomas back on in the 25th over, who validated the move almost immediately by running through the England lower order to wash away all hopes of a late fightback. Thomas struck on the fifth delivery to induce an edge off Moeen Ali for the keeper, before Wokaes tamely pulled a short one to midwicket in the following over. One ball later, Buttler took his eyes off the pull shot and top-edged to Cottrell in the deep. Bowling from the other end, Holder ensured there was no room for late fireworks as he sent Rashid packing off the final ball of the maiden. Thomas fired in a yorker next at Tom Curran right in the block-hole, that rattled his stumps and wrapped up England on 113 on the first ball of the 29th over, finishing with 5 for 21 in just 5.1 overs. Brief scores: England 113 in 28.1 overs (Alex Hales 23, Jos Buttler 23; Oshane Thomas 5-21, Carlos Brathwaite 2-17, Jason Holder 2-28) lost to Windies.115/3 in 12.1 overs (Chris Gayle 77; Mark Wood 2-55) by seven wickets.